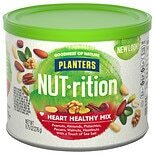 Shop Planters NUT-ritionHeart Healthy Mix Heart Healthy Mix (9.75 oz. )9.75 oz. $699$6 and 99 cents$0.72 / oz. When mid-afternoon cravings strike, reach for a healthy snack mix that can be satisfying and healthful. Try a granola snack bar, mixed nuts, trail mix or other snack mix as an alternative to grabbing something out of the vending machine. Choose healthy snack mixes from General Mills or Planters that give you the energy to power through the afternoon. You can find healthy snack mixes that are sweet, those that are salty, or a combination of the two. Chex Mix snack mixes come in several flavors to satisfy all tastes. There are cheese, chocolate, honey and traditional flavors. Trail mixes are another way to get both sweet and salty flavors in one snack. Mixed nuts are a popular option for a high protein healthy snack that packs nutrients. There are plenty of snacking options here at Walgreens.com. If you're a chocolate fan, there is chocolate bag candy and chocolate bars for a treat. If pastries are your thing, there are cookies and muffins to satisfy. Prefer salty snacks? We carry pretzels, butter popcorn and cheese crackers. Healthier options include almonds, diet & nutritional bars and fruit snacks.